To order this video please send an email to info@lafpdl.com with the following information: Video name, quantity, your name, mailing address, and phone number. This video is being created and distributed through Heartson Productions. The cost charged to us for each video is $15.00 payable via donation. There is no better way to capture the essence of my fathers work than through this video. He is so in his element doing what he loves most, praising and singing to Jesus. 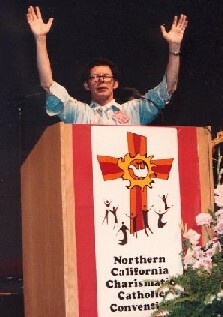 This is a 90 minute video taken during the prayer and praise session at the Northern California Charismatic Catholic Convention in May 2000.